Everything was clear and simple to find. It was excellent. Staff friendly and helpful, advised me that she could order them and delivery them to my house. Toni was friendly and polite, also helped as sizes I needed wasn't out but she went for them in the back and apologised for wellington boots were not in stock and said that she could order them and have them delivered to my house. I have been trying for months to buy some shoes off the peg for my 93yr old father but without success. Like many people his age he has poor circulation in his legs and feet and water retention which means his feet are swollen. Also he has a high instep. I called into your store and purchased a pair of men's navy deck shoes, slip on type with a strap across the instep which fastened with velcro. It is about the only design of shoe he can wear as he cannot bend properly to fasten his shoes . My father tried them on and they were ideal. There are a lot of people of all ages who are overweight and whose feet are often swollen. Also the elderly in particular are vulnerable to swollen feet. Have you ever considered filling the gap in the market by selling shoes specifically designed for customers with swollen feet. I know you sell shoes with elasticated fronts but how about shoes with elasticated sides near the heal which with the aid of a shoe horn customers could put on without too much difficulty. My father wasn't bothered about the style or colour of shoes or even what they were made of. 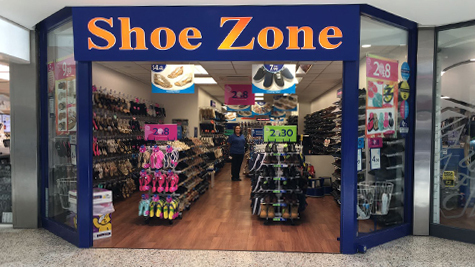 All he wanted was shoes that fit him comfortably and that he could put on himself.Well done the shoe zone.You succeeded as a retailer whilst others failed. My father doesn't walk far and he would not have got his moneys worth out of shoes that were specifically made to fit his feet especially when you consider how much such shoes cost. Got exactly what i wanted and had excellent service.